It’s good to see traditional island products being made, especially when given an innovative twist. And although everyone and their granny has their recipe for marmalade, it’s highly unusual to find a tomato marmalade – and very yummy it is too! We found it pairs excellently well with cheese. The marmalade in question is made by the ladies of the Ženska Zadruga Faria, a co-operative formed in May 2014 by a small group of women from Jelsa on the island of Hvar. They create a range of high-quality foods and cosmetics from locally sourced ingredients. Their aim is to preserve and promote island traditions, while working together to market their products. And although many of the products have their origin in recipes handed down by their mothers and grandmothers, the ladies of Faria are happily creating their own versions. Figolina, for example, adds dark chocolate to traditional dried figs – a very tasty combination of flavours! And Wine Elixir cream and soap sounds wonderfully luxurious! 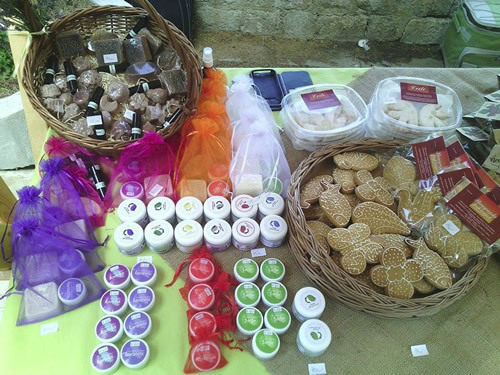 Faria currently has 8 members, whose products range from sweet and savoury snacks to natural herb-based cosmetics and soaps. They have been awarded the accolade of “Hrvatski Otočni Proizvod“, the official stamp of approval for quality Croatian Island Products. The designation is reserved for those small island businesses who produce original, high-quality traditional products in small batches. 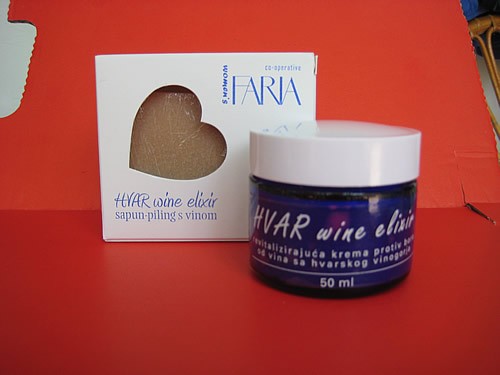 That label helps considerably with marketing and sales, as Faria’s special foods and natural cosmetics appear on the shelves of many exclusive shops, not just on Hvar, but across Croatia. Beautiful presentation at a local fair! Faria sell their products directly at many of the island’s fairs and events. They work closely with the Hvar Winemakers’ Association, and can be found at many wine tasting events. They’re also involved in presentations and workshops with young students, encouraging them to use their knowledge and skills in setting up their own business cooperatives. Thanks to Fedra Gamulin, Faria’s Director, and best of luck with the co-operative! The designation “Croatian Island Product” is awarded by the Ministry of Regional Development and European Union Funds, to products that meet the criteria of excellence, authenticity and tradition. 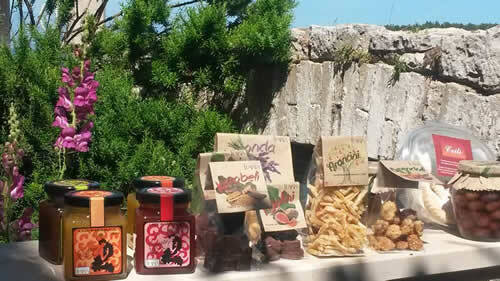 The project was launched in 2007, and to date “Croatian Island Product” labels have been awarded to 182 producers (including 13 organic farmers, and 18 manufacturers with specific geographical indication) for 517 products /product lines from a total of 21 islands (Brač, Hvar, Vis, Korčula, Pag, Krk, Lastovo, Dugi Otok, Rab, Cres, Lošinj, Prvić, Ugljan, Mljet, Šolta, Žirje, Pašman, Iž, Murter, Kornat, Olib) and the Peljesac peninsula. Products include foods (wine, spirits, liqueurs, olive oils, cheeses, pastries, fish, salad marinades, jams and honey), cosmetics, clothing and souvenirs. Look out for them!